You know Mr Porter as your one-stop shop for everything from suits to sweats. But now your feet are covered too. The luxury e-tailer’s recently expanded shoe portal offers hundreds of styles curated from the world’s best designers, ranging from formal lace-ups to rugged boots and space-age trainers. We’ve rooted through the roster to pluck out our favourites, ensuring there’s something to suit any style. Step in. The preppy staple is a true utility shoe, sitting happily beneath pinrolled denim, tapered chinos and even your summer suit (ideally, without socks). This exclusive take on the iconic silhouette is handcrafted from luxurious leather and will cap any outfit, in any season. Bass Weejuns Logan Penny Loafer, priced £295. Some sneakerheads have hot flushes at the idea of getting their trainers grubby. So they’d come out in hives knowing the guys at Golden Goose Deluxe Brand deliberately soiled theirs in the factory, adding months of wear by hand to ensure that each pair is unique. At least you don’t have to stress a wet forecast. Golden Goose Deluxe Brand Francy Distressed Sneakers, priced £255. The worsening weather signals it’s time to switch your office lace-ups for something sturdier. Grenson’s boots combine traditional brogue detailing with a puddle-beating commando sole, for something that will get you to the office in Biblical conditions without you needing to switch to a formal shoe when you hit your desk. 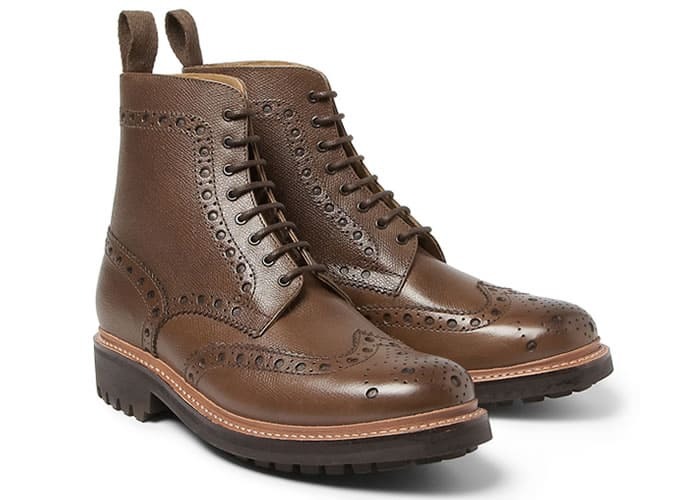 Grenson Fred Grained Leather Brogue Boots, priced £220. Proper Oxfords are a must-own, but if you’re only in a suit occasionally, they don’t often get a run out. The brogue detailing on this pair, from English shoemaker Church’s, dials down the formality a touch, so you can wear them with dark chinos as well as tailoring. Just avoid the temptation to pair them with your denim. Church’s London Leather Oxford Brogues, priced £295. For its take on Nike’s Lunar Force 1, German outerwear brand Acronym reached into the utility cupboard for some of its signature detailing, including a YKK zip that runs the length of the tongue and durable Vac Tech reinforced heels. They’re a statement, so you’re best keeping the rest of your outfit muted. But if the orange is still too much, there’s a black-and-white colourway too. Nike x Acronym Lunar Force 1 Leather Sneakers, priced £165. As Elvis knew, blue suede shoes are a wardrobe staple. That’s thanks to their versatility. In a Derby shape they’re formal enough to offer tailoring a rock ‘n’ roll flourish, but casual enough for off-duty pairings with denim or chinos. Just make sure to keep a can of suede protector handy, and don’t let anybody step on them. Uh-huh-huh. 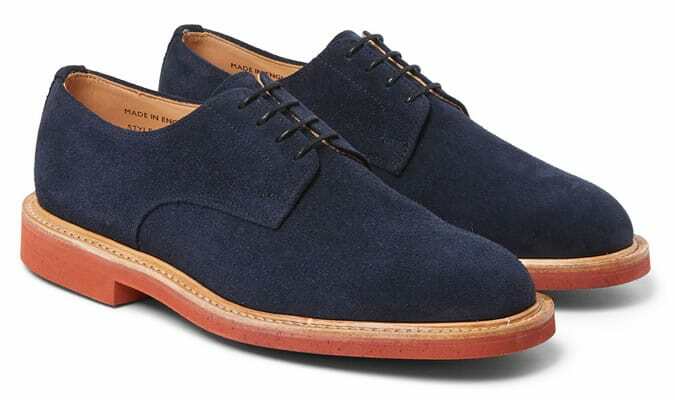 Mark McNairy Contrast-Sole Suede Derby Shoes, priced £230. You don’t mess with a classic. It’s the most unassuming of shoes, which is why Converse’s 80-year-old Jack Purcell sits as comfortably with chinos on the Riviera as skinny black denim and a microphone stand. We’d advise buying double; a pristine pair for your tailoring, and your beat-em-up Purcells for the weekend. Converse Jack Purcell Canvas Sneakers, priced £50. The monk-strap’s ubiquity has faded since the heady #menswear days, but a quality pair still offers an alternative to your everyday dress shoes. Santoni’s are handmade in Italy and Goodyear-welted so they’re endlessly repairable, with a deep brown colouring that matches everything in your wardrobe. An investment, yes. But one that will pay off for decades. Santoni Leather Monk-Strap Shoes, priced £565. The perfect transitional shoe, suede is breathable so prevents your feet overheating if you’re more pessimistic than the forecast, but the double-stitched midsoles are waterproof, just in case you’re right. The grey-green upper is bang on-trend, but subtle enough not to date. Think of these as your new everyday shoe. Heschung Genet Suede Chukka Boots, priced £295. A pair of crisp white trainers are as integral to the modern man’s wardrobe as Oxfords, but it’s tough to find something that’s both minimalist and unique. These leather sneakers, from Amsterdam’s Filling Pieces, are handcrafted in Portugal using quilted leather, ensuring they stand out in the right way. Filling Pieces Quilted Leather Sneakers, priced £155.